The 8 Inch Cold Smoke Generator is made from heavy gauge 2 1/2″ SCH 40 6061 precision machined aluminum for a proper seal and long life. 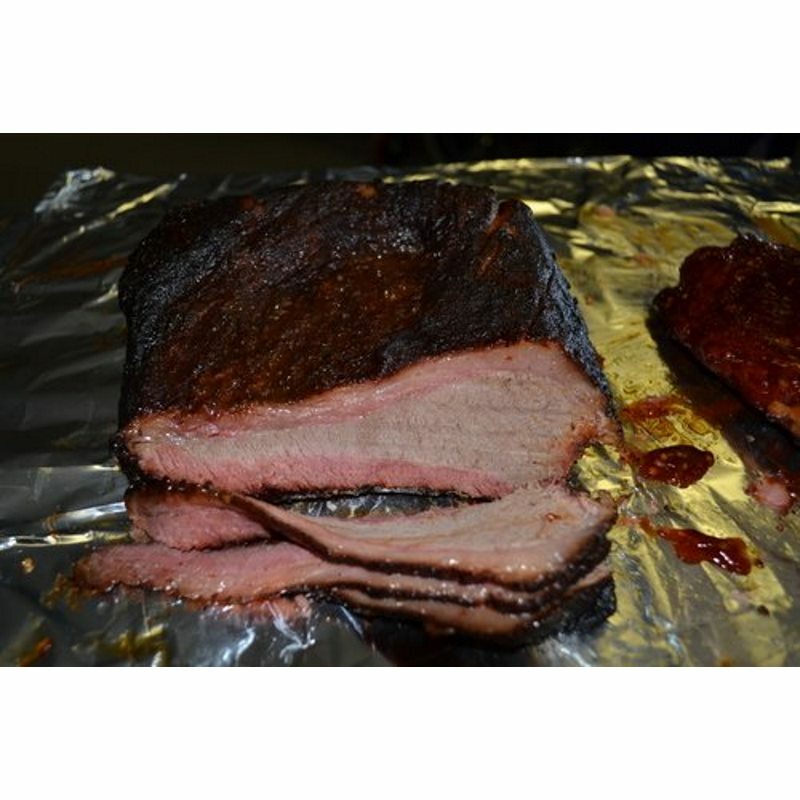 Any Smoke Daddy can be refilled at any time during the smoking process without having to relight it or open your smoker. They are designed with the smoke outlet tube above the fuel source to prevent clogging and have a removable end cap for easy lighting. 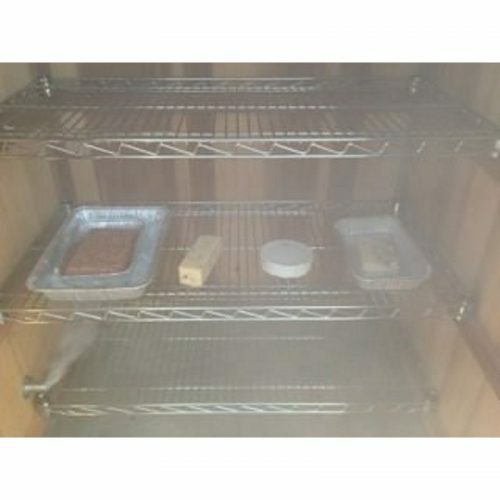 It also has plenty of room for ash and is designed so not to interfere with air flow. 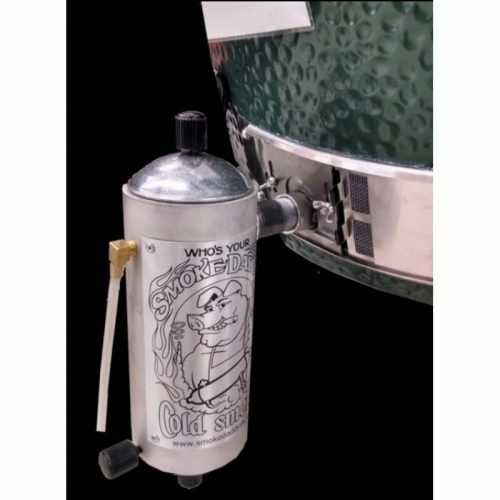 The 8 Inch Smoke Daddy holds 2 cups of fuel and will smoke for up to 1 hr on a single load. Great for smoking during the day, and provides plenty of smoke for the larger smokers. Includes new stainless steel cleaning brush! 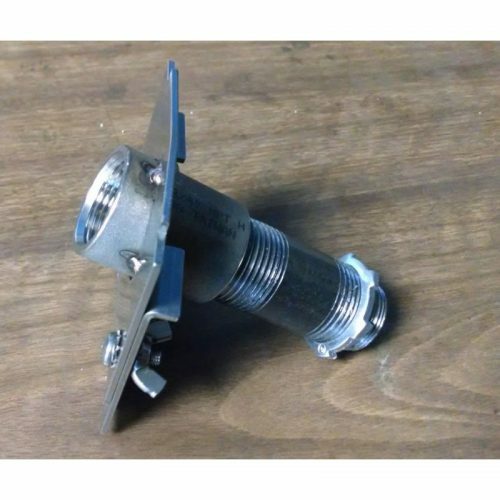 You can easily attach it to your smoker by drilling a 1 1/8″ hole and inserting the outlet tube into your smoker. 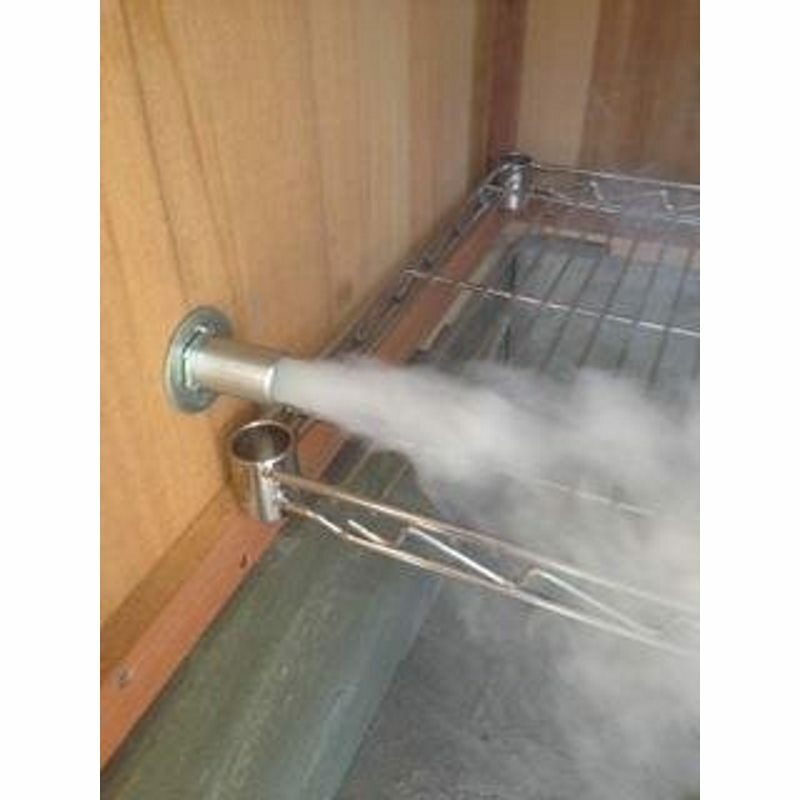 To light it, remove the end cap and fill the smoke chamber with your favorite wood chips/chunks. Then light it from the bottom with a small propane torch or you can also use a match and a crushed piece of charcoal. Place the end cap back on with air pump running and you’re smokin’! 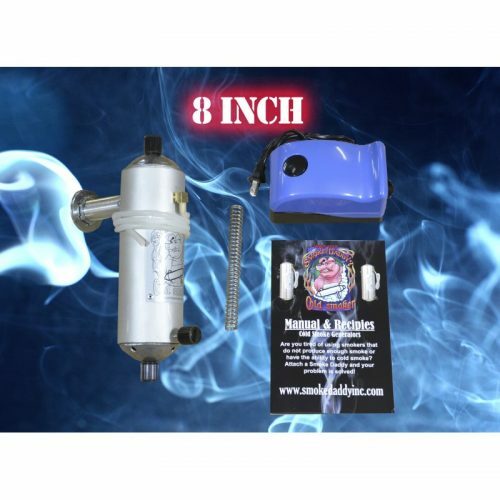 We now offer a high output electric pump that allows adjustment of the air flow on the pump. This is great for having a high volume of air at startup, allowing some woods to be lit more easily. 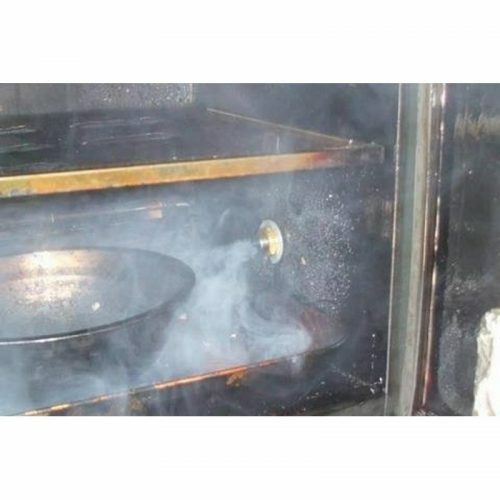 You can then lower the airflow gradually to the desired amount. 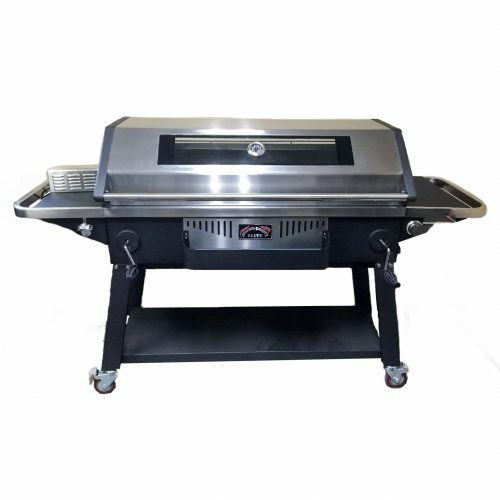 The Smoke Daddy 8” is for the larger BBQ grills and medium size smokers and works best with small wood chips and pellets. Great for smoke at temps below 100 degrees. Good for hot smoking as well. *PLEASE NOTE* If attaching the cold smoke generator to a Green Mountain Grill, please select the”Upgraded Air Pump for Green Mountain Grill” option. 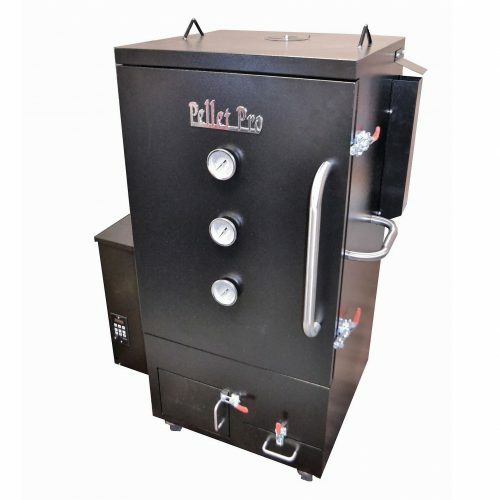 The air pressure produced from the GMG will cause a backdraft through the cold smoker using the standard 110v Air Pump.